It’s the part which sees someone different from you as a cancer to be cut out. You can pretend you’re part of the Elect. You can pretend that nothing will change for you. You can pretend all this, as you work for Wal-Mart, as your schools fall into a chasm, as your children have fewer opportunities than you. You can pretend all this as your water is poisoned, your air is fouled, and your health is disregarded. You can think that you’ll be taken care of, when all that’s happening is that you’re being taken for a ride. Either “they” will rise up, with nothing left to lose; or those whom you so blindly follow will put the final touches on the Great Work. You will find out that you were never really part of the club, but useful idiots, used to kill yourselves, used to kill what used to be a moderately good country. When the niggers and the kikes and the fags and the chinks and the spics and the towel heads are all put in their places (maybe even beneath the ground), do you think you’ll escape? Do you think you’re that special? Do you think you’ll get all the goodies that you denied them? Do you think you’ll move out of that trailer park to a grand mansion? You probably do. And that’s why you’re idiots. Useful, but idiots. And no one will speak for you, because those who should have been your allies will be gone. 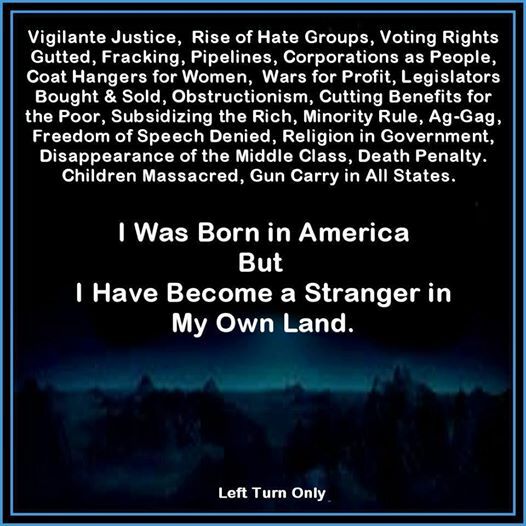 There is an “us” versus “them” in this country, and you have it all wrong. You’re not on the winning side. The Koch’s value you only for your acquiescence. Once that’s no longer required, expect the deluge. And you’ll wonder how things got so awful. The mirror will give you your answer. If this country has any hope, it has to get the “us” and “them” right. The “them” are the few who think that the world is theirs by right. The “us” should be the mass who shouldn’t want to see a world not imagined by the most fervent dystopian writers. But “they” know how to keep us separated. It’s so easy. It’s God and culture and tradition. It’s fear. Fear is the soul killer. It has to be confronted and rejected. It has to be thrown back in their faces. In these latter days it’s difficult to keep up hope. I find it difficult. But what else can we do? As the great Stephen Hawking said: “However bad life may seem, there is always something you can do, and succeed at. While there’s life, there is hope.” Hope is our greatest weapon. We have to keep using it.